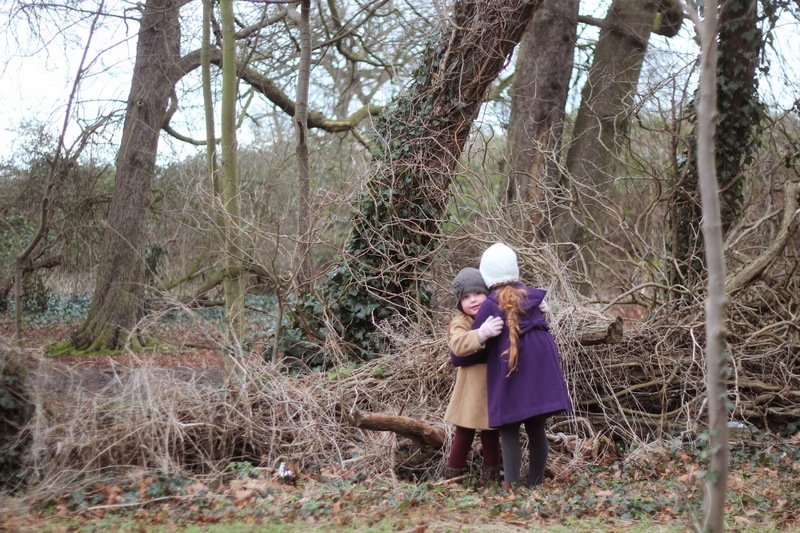 I took a few photographs of the girls in the woods but this one picture shows the real bond between my girls. Elle said "Can i hug her Mama?" and who was i to say no. It is what they spend most of their time together doing. Lately, Elle has been very curious about how babies come out and are made. The latest conversations between the girls are about what they did in my tummy before they came out. Mia said a few weeks ago " Mama, i had such a lovely time with Elle in your tummy. We had teaparties and played games but then she came out and left me in there on my own." Elle then piped up "Yes Mama, we had such lovely times in there and i didn't want to come out and leave her in there". Elle keeps asking how long Mia was in there all on her own before she was allowed to come out. She is very concerned that she left her sister on her own and that her sister was sad. It really pulls on my heart. I have explained to her that she wasn't made then but they seem to both believe so much that they were together in there and they talk alot about their special time in mummies tummy. I love that they talk about this time together and how it makes them giggle and laugh and how they completely believe in their hearts that they have always been together. Two nights ago, I let Elle sleep in bed with me as Gilles is away working and i told her that i am the one person in the world that knows her more than anyone and she said "No Mama, Mia does". "Siblings" is a monthly link up where myself and 6 other bloggers all share a photo of their children and then we each send you off to look at another blog. You can then go around in a circle, viewing all of the wonderful photographs and then why not link up yourself if you have two children or more! This month, i am sending you over to Lucy at Dear Beautiful. She is the beautiiful Mama behind Siblings and has the most beautiful children. Her blog is just enchanting! What a lovely way to think about babies! Made me feel sad that she felt she had been left behind though. Gorgeous photo and it sounds like they have such a special relationship. I love that they both believe they were in your tummy together, it is such a sweet way to think about it. What a sweet picture! I love how you capture their relationship, they must be such a joy. Such a sweet misconception! How lovely that they couldn't imagine not being together. I am sure they will grow up remaining just as close. This is one of the darling things I've read in ages. So, so sweet. What a gorgeous, gorgeous photo! I love the colours and like you say, capturing their cuddles is just perfect. I love the idea of them having a little tea party in there. What cuties. What an amazing bond between your two - my twins did share my tummy but usually were kicking each other - or me! How amazing our their little imaginations?! I love talking to my daughters and listening to the crazy and always funny things they come out with. They have such a beautiful view on life. Beautiful photo as ever- the forest really i the best backdrop isn't it?